This second instalment in the epic Starbound trilogy which began with THESE BROKEN STARS introduces a new pair of star-crossed lovers on two sides of a bloody war: Jubilee Chase, a tough soldier who has faced more than her fair share of demons, and Flynn Cormac, the rebel leader who has already lost so much. Lee is captain of the forces sent to Avon to crush the planet's rebellious colonists, but she has her own reasons for hating the insurgents. Flynn is leading the rebellion against the powerful conglomerate that rules Avon. These corporations terraform uninhabitable planets across the universe and recruit colonists with the promise of a better life for their children. But they never fulfilled their promise on Avon. Desperate for any advantage, Flynn does the only thing that makes sense when he and Lee cross paths: he returns to base with her as prisoner. But as his fellow rebels prepare to execute this tough-talking girl, Flynn makes another choice that will change him forever. He and Lee escape together. Amie Kaufman and Meagan Spooner are longtime friends and sometime flatmates who have travelled the world (but not yet the galaxy), covering every continent between them. They are sure outer space is only a matter of time. Meagan, who is also the author of the Skylark trilogy, currently lives just outside DC (though she considers herself an honorary Aussie), while Amie lives in Melbourne, Australia. Although they currently live apart, they are united by their love of space opera, road trips, and second breakfasts. I’m a little over YA series novels. To me, they reek of marketing; a tool to make me commit to buying more books (like I don’t already read and buy enough anyway). 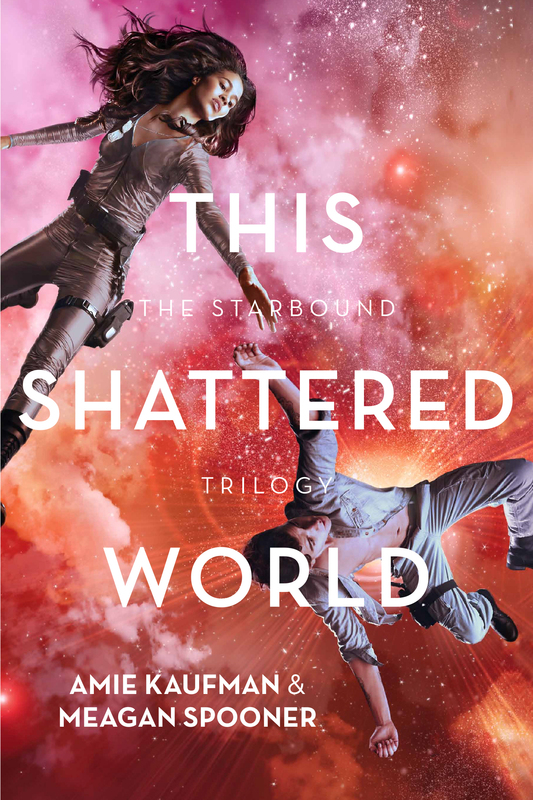 Yes, this is the second in a series, and while I loved the first instalment, These Broken Stars, I was a little tentative about its sequel. Too often they fail to meet my expectations. However, This Shattered World succeeds where so many have failed. Rather than writing a story that follows on directly where the previous left off, Kaufman and Spooner have chosen to create a series within the universe of the first and, while referencing characters from the previous book, they introduce a new cast of characters in a fresh context. It works and more importantly, even though it is a series, it operates effectively as a stand-alone novel. This Shattered World focuses on the characters of Jubilee Chase and Flynn Cormac who live on Avon. From opposite sides of the track, the romantic elements provide unquestionable parallels with Romeo and Juliet and West Side Story type narratives. This is a planet at war, with Jubilee representing the forces sent to crush the brewing rebellion in which Flynn plays a key role in. Kaufman and Spooner’s writing is compelling and their development of character is admirable. They have crafted a story which investigates intelligently the nature of political uprisings from both sides, along with the real cost to the humans involved. 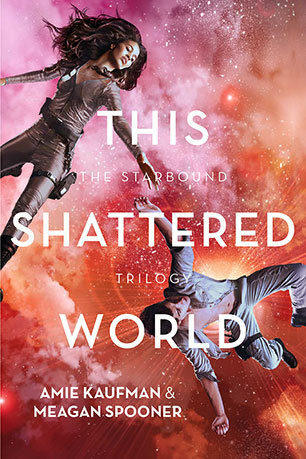 Furthermore, and developing the science fiction elements of the story, This Shattered World continues to explore how scientists might manipulate people and technologies, calling into question ethics and morality. Although I probably wouldn’t use this kind of book in the classroom as a shared novel (falling loosely into the Dystopian genre) it is something that I would definitely recommend to students from year nine or ten upwards. For me, it is more Science Fiction than Dystopian and is a great story to extend students beyond The Hunger Games, while whetting their appetite for more sophisticated texts. Senior students may find it useful for an independent study, comparing the book with either Dystopian or Science Fiction titles. However, to be fair, the book probably lacks the kind of depth required for the rich analysis undertaken in higher level literature courses. Apparently there is another story in the series yet to come. I understand that this one explores life on Corinth and no doubt introduces readers to another amazing world and great cast of characters. Why stop at three books? It seems to me that Kaufman and Spooner are really onto something here and I have no doubt that they could write another ten books in the Starbound universe. Go for it ladies; what the world really needs is more Science Fiction written by women for women! 'There are many sides to every story' and in this novel we are presented with the story of the planet Avon which has been terraformed but seems to have stalled in its development. The people who came to settle the planet and make it their home are disenchanted with the terraforming company and believe the truth is being withheld from them; a rebel faction has formed to fight for their rights. The Company has engaged government troops to help keep the peace on the planet and to protect their infrastructure. Government troops work to keep the peace but something on the planet is affecting some of them, they suddenly become extremely violent, in a kind of trance, they come out of it with no memory of what they have done and why. As a result most soldiers only stay on Avon for short periods. Captain Jubilee Chase, the toughest soldier on Avon and Flynn Cormac a leader of the rebel group find themselves coming to the realisation that something else, something sinister is happening on Avon, even though they have completely different views on the conflict between the troops and the rebels, they are the only ones that seem to realise that there is something else behind the stalled development of the planet and the “Fury” that seems to affect the soldiers. There are in fact more sides to what is happening on Avon than anyone could imagine. Jubilee and Flynn fight to expose the real cause of Avon’s problems and to enable Avon to develop into the sustainable planet everyone wants it to be. La Roux Industries is hiding a secret laboratory on the planet where they are experimenting on an alien life form, and the alien life form is fighting for survival. This is a story of conflict, of learning to see things from a different perspective; of working together through adversity to do what is best for everyone no matter what the personal cost. I would recommend this book to students interested in Science fiction, Adventure and even Romance novels. The second novel in the Starbound trilogy, I feel that this novel can also be read separately.